Find your balance on holiday! 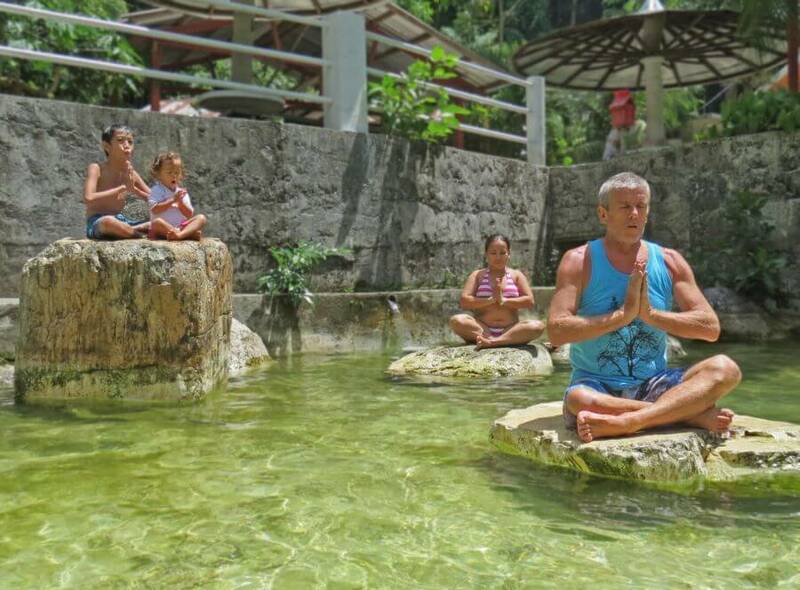 Uplift your body and soul with vitalising yoga on beautiful Boracay island! Why practice yoga with us? It’s fun, it’s different and it’s a terrific complement to all other activities you currently enjoy. 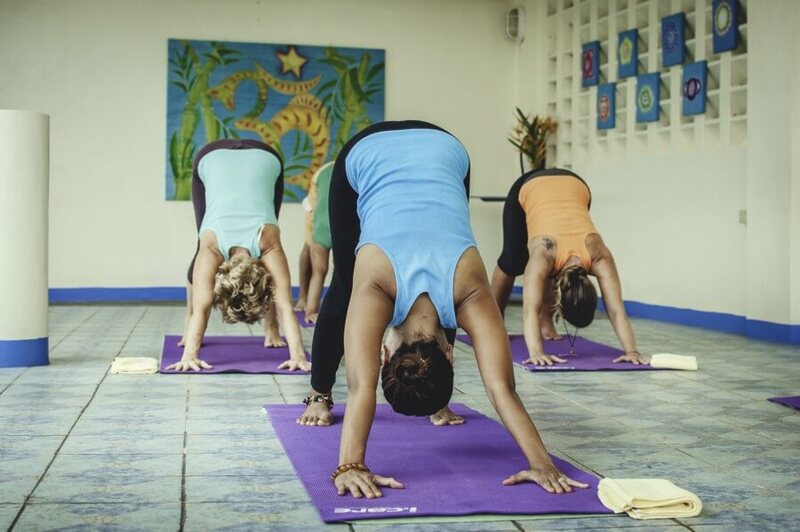 Boracay Yoga offers friendly classes where knowledgable teachers combine group dynamics with individuals needs and goals. Are you new to yoga? 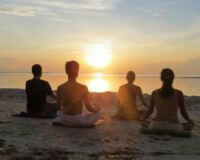 HATHA YOGA is a classic yoga style of gentle physical exercises and breathing control. Our hatha-class is a slow-paced stretching class starting with a short seated meditation and simple breathing exercises. This is a good place to learn beginners' poses and become comfortable with yoga. Hatha Yoga simply makes you feel great! Do you want your yoga class fast and sweaty, like a great workout? This dynamic yoga style allows the body to continually flow from one pose to the next becoming a complete body exercise. This style of yoga requires physical energy and for your mind to be focused and present in the body. If you like to keep moving, this style is definitely worth a try. This 60-minute class will lead you through what is commonly called half of the Primary Series of ASHTANGA YOGA. It is a fast-paced, intense style of yoga beginning with sun salutations. This powerfull, athletic style of yoga appeals to those who like a sense of order and have already some yoga experiences. Be prepared to flow! Yoga for Kite & Windsurfers NEW!!! This custom-made yoga class for all kite & windsurfers will make your time on the water more enjoyable. Yoga strengthens your muscles, improves flexibility and calms down your mind. 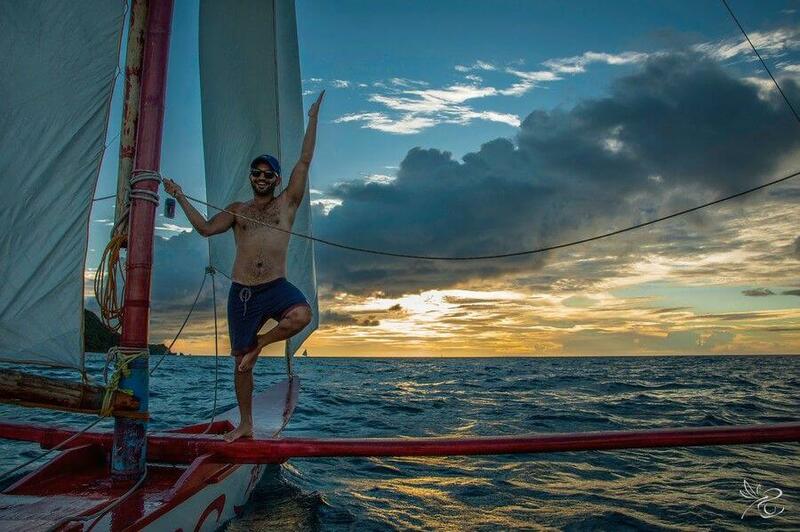 Physically prepared and with a clear mind you will easily learn new moves and avoid any injuries while sailing. Reach your peak performance! Everyone is welcome to join just bring your heart and share your passion! Hatha yoga class is conducted according to the student's experience level and health conditions, so that everyone can attend the class. Even those who have stiff bodies or who have never done yoga but want to practice step by step. We take time to hold each posture, practice deep breathing and motion exercises without over exerting the body. Ha means sun and represents the vital prana and Tha means moon and represents the mind and the lunar qualities. 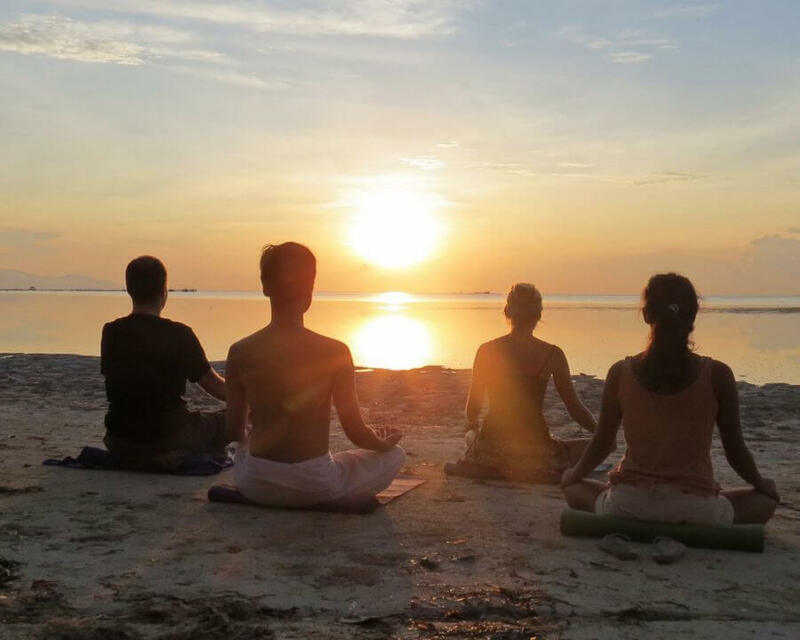 The main object of hatha yoga is to create an absolute balance of the interacting activities and processes of the physical body, mind and energy (Prana). When this balance is created, the central force (Sushumna nadi) will push impulses upwards and evoluate consciousness. As you practice you will become more aware of your body, you will be able to overcome stress and cure various negative conditions such as stiff shoulders, back- or head ache, insomnia, stomach problems, autonomic ataxia, menopause, etc. Your mental and physical well-being can improve your quality of life. Vinyasa flow is a workout that will change your life, if you can survive it. 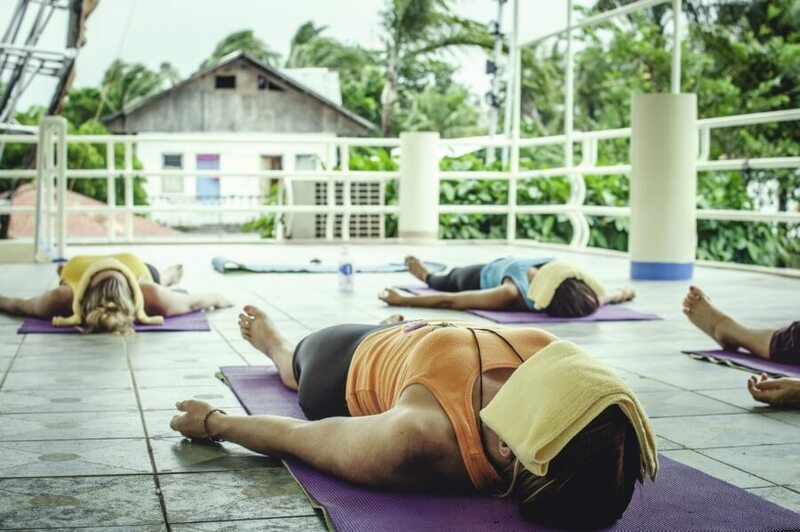 Vinyasa Flow Yoga is a powerful, energetic form of yoga where students fluidly move from one pose to the next while connecting their breathing to their movements. A Vinyasa class flows from one pose to the next without stopping to talk about the finer points of each pose. A really hard, advanced vinyasa flow class will be the hardest workout you’ve ever had. It’ll involve intense cardio and strength-building exercises, as well as some core work and a handful of asanas to increase flexibility. Your class will start with a series of Sun Salutations. That way, students come away with a good workout as well as a yoga experience. If you're new to yoga, it is a good idea to take a few classes in a slower style as Hatha Yoga first in order to build up the foundation of flexibility and strength necessary for the more difficult asanas. In this Ashtanga Primary Series, we want to inspire people to find their yoga path so you can also practice at home. Ashtanga yoga involves a set sequence of poses that a practitioner follows in the exact same order every class. We will start with Five Sun Salutation A, Five Sun Salutation B, following by the Standing Sequence, the Primary Series (Seated Postures), and the Closing Sequence. Once you hit the seated postures, you're doing what's called vinyasa (mini Sun Salutations) between each posture. This keeps your body warm, which enables you to get deeper into poses. Vinyasas are the link between postures that make this type of yoga more like a fluid dance, and the constant moving not only works your muscles but also helps to quiet your mind. This means you'll probably get pretty sweaty, so it's best to wear long pants to absorb your sweat. Ashtanga Yoga is one of the most powerful, popular and proven methods of yoga first introduced to the west by K. Pattabhi Jois of Mysore, India. It involves synchronizing the breath with a progressive series of postures that produce intense internal heat and a purifying sweat that in turn detoxifies muscles and organs. The result is improved circulation, a light and strong body, and a calm mind. If you're not a touchy-feely person, it might shock you when you show up to class and the instructor press, pull, and twist your body to help you get deeper into postures. Don't worry- our instructor has magical hands and experience and these assists will feel amazing, and they might be the reason you keep coming back. Once you memorize the sequence, you can practice on your own at home. If you're a kiteboarder, windsurfer, diver or just full of high-energy, a can't-sit-still kind of personality, sign yourself up for this custom made Yoga class. This type of yoga is challenging, quick-paced, and just the thing to open your tight hamstrings, hips, and shoulders. Practicing yoga awakens the body, increases spacial awareness and keeps the limbs flexible areas often ignored in daily activities and sport. Yoga lengthens and strengthens your muscles and keeps the body movements fluid with greater balance skills. This reduces the risk of injury and forms a strong foundation for all especially kite & windsurfers to nurture their skills. 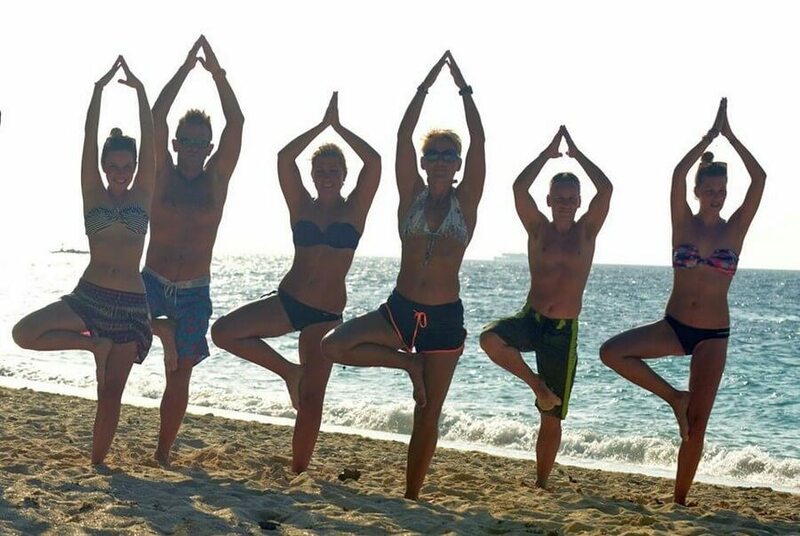 These yoga classes can be joined either by participation in the Windsurf Kite Yoga Camp or on an individual basis. The yoga classes are an added bonus keeping everyone active even on non windy days. Simone has lived on Boracay Island since 2003 and is well known as a windsurfing and kiteboarding instructor at Funboard Center Boracay. During all these years she has also practised different yoga styles as a perfect complement to all water sports. 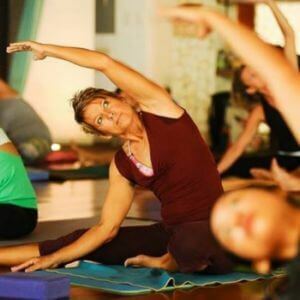 Her passion for yoga as well as it's mental and physical benefits are the reasons why she became a yoga-teacher so that she can share her experiences with her students. 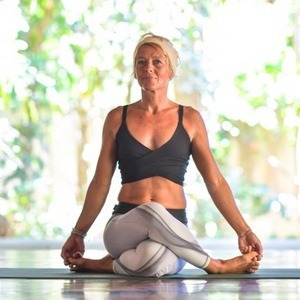 In 2012 she joined the Teacher Training with Clayton Horten from GreenpathYoga and has yearly participated in several Yoga workshops around the world to expand her knowledge of different Yoga styles. Simone's classes are based on the Ashtanga Yoga principal but conducted according to the student's experience, so that all can attend the class including those who are not so flexible and those who are new to yoga. Simone's style of teaching allows time for each student to comfortably come into each posture, practice deep breathing and dynamic movements without over exerting the body. Simone also customizes her teaching to challenge more advanced students to reach a higher level. 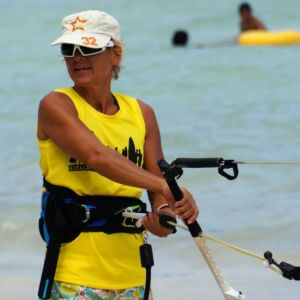 Since 2014 she started the first Windsurf Kite Yoga Camp on Boracay island and invites all sea sport enthusiast to experience the beauty of yoga and so combines active holidays with relaxation. Yoga has given Marc a healing journey. Born 1958 in Luzern, Switzerland, he suffered at age two, a polio infection that resulted with a right leg handicap. This handicap lead to a life of daily pain as he got older. At the age of 38 his doctors advised him to have a major back surgery. Instead he decided to look for alternative ways to relief his symptoms and this lead him first to the Five Tibetans exercises. These 5 Tibetans helped him a lot, and at last he felt he could achieve more in life then just living with pain. During his exercises he learned from a friend about Lu Jong (Tibetan Healing Movements). To find a trainer for this his quest lead him further to India, where he found a Lu Jong teacher Lama Lobsang from Tibet. Lobsang introduced him to the tibetan healing movements and certified him in Lu Jong 1 and 2. This strengthened his body and brought further relief. 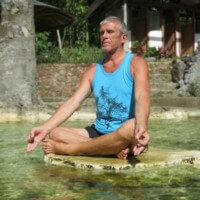 In 1997, Marc moved to Boracay and was introduced to Sivananda and Hatha Yoga through Mo-ching Yip. His yoga practice lead him to participate in a yoga teacher training program, so that he could share with others the healing power of yoga. 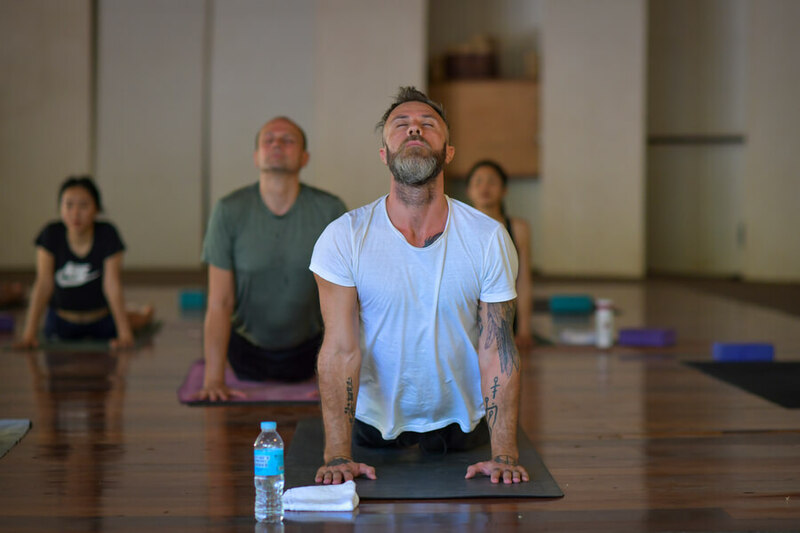 In 2009 he graduated from a yoga teacher training course with Clayton Horton from Greenpath Yoga and now teaches Hatha Yoga at Boracay Yoga. By special request he is happy to introduce all interested persons to the 5 Tibetan or Lu Jong movements. 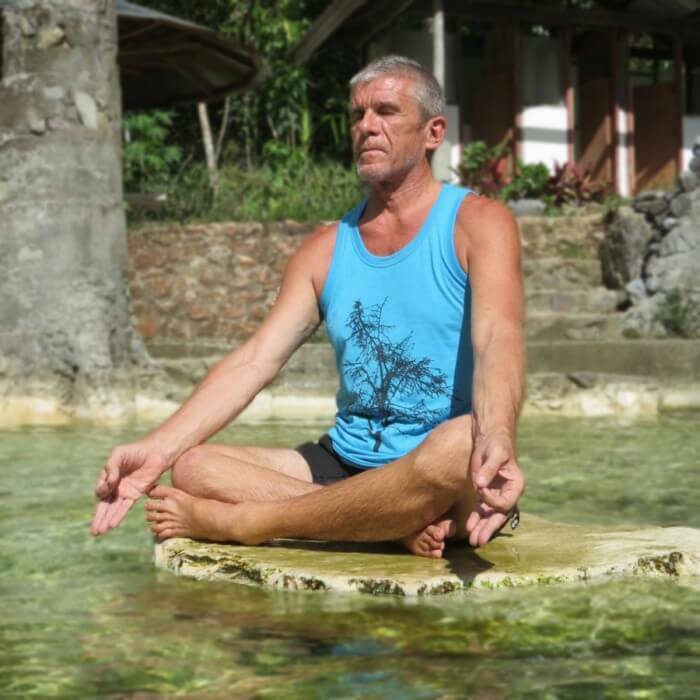 Frank's yoga practice started in 2009 to complement a long distance running routine. Upon realizing that running had become too competitive to be healthy, he made the complete shift to yoga. Under the guidance of Bela Lipat, his daily yoga routine became a spiritual practice that has now become his foundation in life. A Teacher Training under Clayton Horton followed in 2012 with the sole intention to deepen his practice. 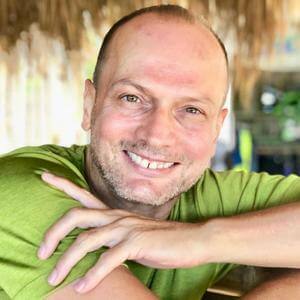 In 2013, Frank studied 3 months in Bali under the guidance of Prem and Radha of Ashtanga Yoga Bali Research Center where he also got an extensive introduction to Ayurveda. 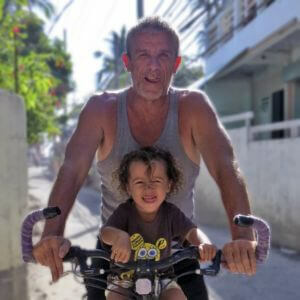 Through his dedicated Ashtanga practice, Frank became passionate about teaching. This is something we value & all have in common at True Yoga ~ the teacher is also a student. 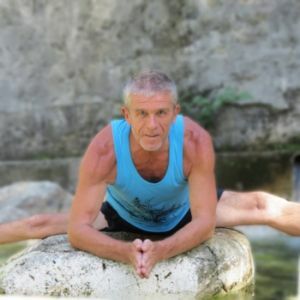 Join Frank as he guides you on your Ashtanga experience, where he also shares the spiritual & health benefits that yoga has given him. Yoga found me at Mandala Spa in 2005. After completing a two-year, 200-hour teacher training in 2011, my practice & teaching are now deeply rooted in Anusara Yoga, a school of Hatha which combines the heart-opening Tantric philosophy with universal principles of alignment; earlier in 2008, I received my certification from the Sivananda Yoga Vedanta Ashram in India. What brought me to the mat is the place where I want to serve from. Yoga has given me the courage to follow my heart and this is what inspires me to share it so others can do the same. Private classes are available at any time, just contact us. 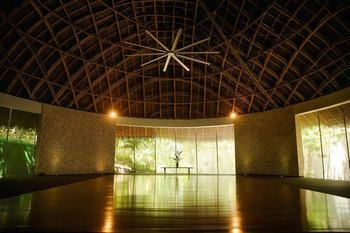 Classes are held at "The Vessel at Mandala Spa & Villas".